Britain's largest retailer says their avocado packaging will improve shelf life by up to two days, helping to cut food waste. Tesco has rolled out a new avocado packaging that will increase their shelf life by up to two days. The retail giants say the new technology will help cut food waste and improve quality for customers following several years of trials. The packaging used UV light treatment and improved wrapping film and was developed by Tesco fruit and veg suppliers Greencell. 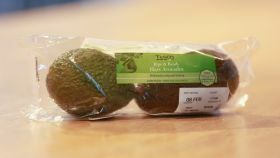 Tesco avocado expert Mike Corbett said: “Avocados have recently soared in popularity as a healthy snacking food but frustratingly, once ripe, they can deteriorate fairly quickly. The avocados will go on sale in 1300 Tesco stores and will be sold in a “ripe and ready to eat” twin pack format, priced at £1.89. In September last year Tesco announced it will tackle food waste by working with its suppliers to meet the UN sustainable development goal of halving food waste by 2030. They released miniature avocados and frozen avocado slices in a bid to combat waste, as well as introduce their “Perfectly Imperfect” range of wonky vegetables. Avocados have soared in popularity according to Tesco, with sales up 10 per cent in the past year.